Observations that are insightful and honest don't automatically render them entertaining. And maybe entertainment isn't exactly what writer/director Jim Jarmusch is shooting for in his latest endeavor, Paterson, but it can't help but to seem that boredom outweighs any merit born from the introspection on display. More than anything it seems Paterson might be the auteur pushing his limits to their breaking points-seeing just how far people will follow him down the poet hole without promising them much in return. In Paterson, Jarmusch coerces a group of individuals and their routines into a "week in the life" structure that sees the titular Paterson (Adam Driver) going about his business, observing others, and ultimately leaving little impression of his own. Some may argue that the quiet charm of Paterson comes from the way in which he doesn't necessarily participate in life, but how he observes and interprets it as communicated by his writings that are sprawled across the screen. 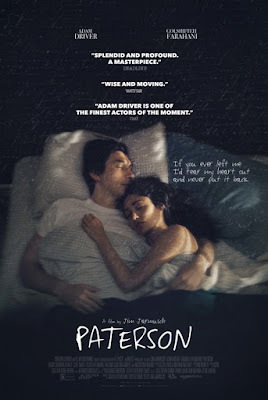 One might say Paterson's appeal comes from the small truths that are highlighted in his relationships with those he encounters on a daily basis whether that be with his wife, Laura (Golshifteh Farahani), his boss, Donny (Rizwan Manji), or the bartender (Barry Shabaka Henley) at his favorite spot that he visits each night not necessarily to shoot the breeze himself, but rather to hear others vent about their own lives. The one aspect in which I could see such a point is in the dynamic Jarmusch allows to play out between Paterson and his dog Marvin. Marvin is a posh little English bulldog who clearly sees himself as the protector of Laura and with whom he shares something of an equal disdain with Paterson. Watching the two eye one another and the contemptuous nature of the relationship go back and forth makes for some of the films biggest laughs and unfortunately for some of the only entertaining moments in an otherwise routine film about routine. In essence, Paterson is a film not without its charms, but its paper thin premise proves unable to support its two hour runtime with the intention to uncover how a very structured and sobering existence might still prove to be surprising only revealing as much to be just as ordinary as one may expect. Those points considered, Paterson is occasionally inspiring and it's not that it's impossible to see the artistic merit of taking in more restrained, quiet material (I'm typically good with a reprieve from the bombast of most productions these days), it is simply that Jarmusch knows what he wants and conveys what he means and then feels the need to say it again and again. One could easily glimpse how Paterson might have been a small, but intensely introspective short film chronicling the difference in the worlds of a single couple-Paterson's defined by routine while Laura's is ever-changing. About how Paterson draws from such differences and inspirations for the poetry he composes each morning before setting out on his bus route that effectively conveys the ups and downs and little truths of everyday life even if we pretty well know what the day will bring. Unable to help himself though, Jarmusch moves along through the full week and similar scenarios; coming up with just enough different variations on each to justify the existence of the feature without adding anything to the point viewers are able to pick up on by Wednesday. 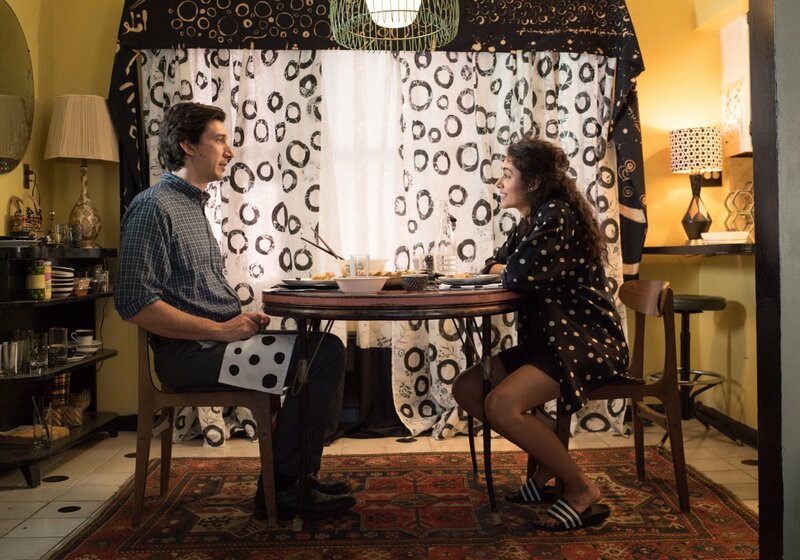 Paterson (Adam Driver) and wife Laura (Golshifteh Farahani) enjoy dinner together, routinely. And so, it becomes the little differences in the structured monotony of Paterson's days that lend to those aforementioned charms and inspired moments. The most recognizable of these being the small anecdotes Paterson overhears from passengers as he drives his bus, those he acquires glimpses of at the bar including Marie (Chasten Harmon) and Everett (William Jackson Harper) who are constantly going through a breakup, as well as the complaints from Manji's Donny which Paterson knows will undoubtedly be complaints, but that he is willing to listen to anyway. It is in these small events that viewers begin to notice the similar, but differing details that define and shape our titular protagonists days. This is all well and good and it certainly helps that Jarmusch paints a moving, more openly optimistic portrait of the Northeast which has recently been plagued by Jersey shores and other sorts, but Paterson ultimately never presents enough of itself to garner a vested interest. 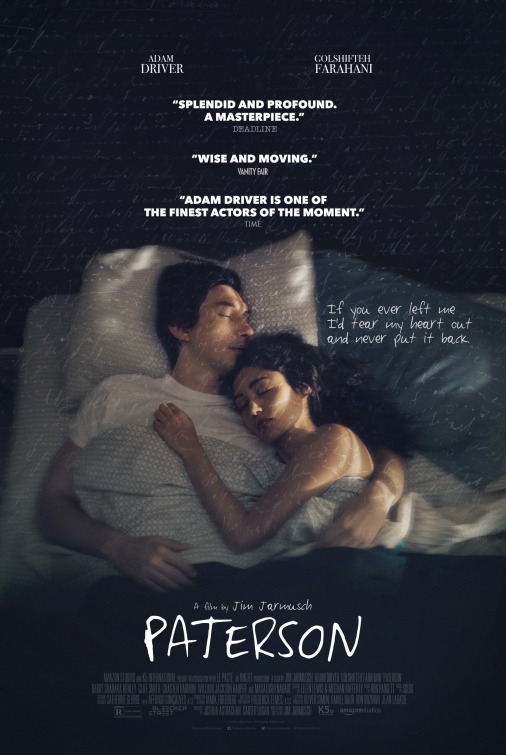 The expectation is that there might be some kind of payoff despite it being easy enough to know Paterson's life, like most of ours, won't follow a particular arc. That there might be some kind of natural stopping point or climax that made Jarmusch want to set Paterson's story within this particular week, but rather the optimism and hopefulness inspired by the mundane setting and blissful marriage between Paterson and Laura is celebrated simply by the two characters knowing that at the end of the day, no matter what good or bad happens, they still have one another to find happiness in. Paterson doesn't seek to dole out a lesson or zero in on a certain facet of human life and dissect it, but rather it feels Jarmusch's script and low-key directing only seek to capture this single week in a lifetime of work where all that has been earned through years of observations comes to essentially mean and be nothing other than an assortment of memories. Forced to start a new, but too tired to begin again we are left to wonder where our titular hero might go from here. In natural indie style, Paterson leaves audiences with a fair number of questions that might re-frame the entirety of the experience we just witnessed, but in true indie style it is never explicitly clear as to the intention of certain conversations or the meanings of certain objectives. It's not that open-ended conclusions and forming one's own interpretations aren't satisfactory, but more again that because nothing of what we've seen precede these final scenes gives a great sense of interest or care beyond a slight, "that's funny," or a chuckle followed by, "that's accurate," that the final conversations or otherwise devastating actions don't land with any real impact. Again, while there are certainly cases to be made around Driver's quietly observational performance given he does much with very little dialogue-more or less soaking in all that Farahani's Laura exudes it never feels like enough. Farahani's presence, as it makes up for her counterparts tranquility in spades, is the most energizing thing about the film and admittedly compliments who Paterson is and cements their solidarity in rather lovely ways. Paterson, in many ways, is a romantic film about romantics-he in his simple pleasures with no exact ambition and she with her ever-changing ones. Jarmusch's ode to hobby artists who understand their talent may never match the heights of such a skill and thus resign themselves to little ambition is indeed telling and oftentimes appealing, but never does it feel as absorbing as the poetry that keeps our titular bus driver moving forward. But hey, that Moonrise Kingdom reunion made it totally worth it.